This post was written by Kyle Willett. 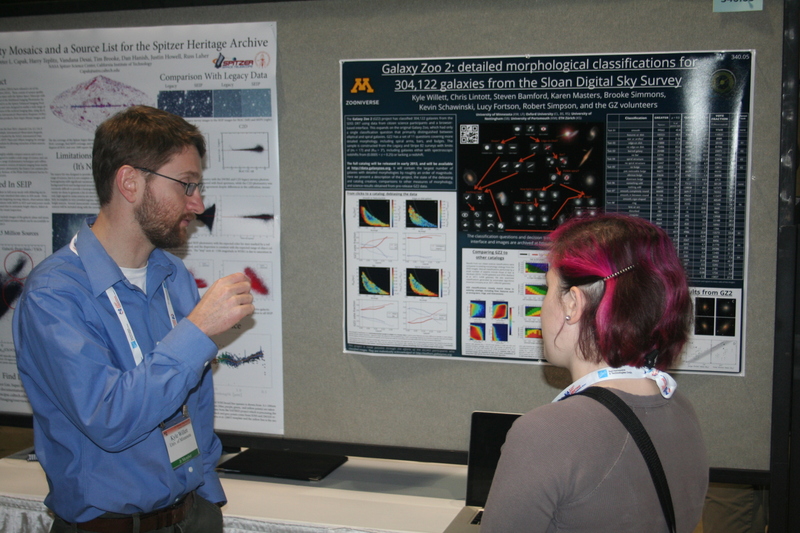 He is a postdoc at the University of Minnesota and a member of the Galaxy Zoo science team. It’s been a couple of weeks since the 221st meeting of the American Astronomical Society (AAS) in Long Beach, California. Kevin and Bill already made several excellent posts on their conference experience (tip: showing data hot off the telescope and having Swiss chocolate at your poster really generate foot traffic). I wanted to write a bit more about the research that I presented and how it related to other topics at the meeting. My poster was up during on the third day of AAS, in the “Catalogs” section of the big poster hall. This is a bit unusual in that the posters there were sorted more by their methods, rather than science content. A group like this is useful for identifying projects with similar challenges, including curation of large data sets, reduction techniques, and how to best publish the data so the scientific community will recognize and use it. The content varies widely, though – I got to compare what galaxy morphologies might have in common with catalogs of bright stars, exoplanets, and infrared mosaics. Kyle Willett (@kwwillett) talking about GZ2 with Nicole Gugliucci (@NoisyAstronomer). Photo by W. Keel. The content of my poster focused on three topics. The first was a description of the Galaxy Zoo 2 project, describing the new questions we developed (and that you answered) and the sample of galaxies in the Sloan Digital Sky Survey that the results cover. This is slightly different from the original Galaxy Zoo, since GZ2 uses a brighter sample of galaxies in which more detail can be seen. The second portion was my work on data reduction for the Galaxy Zoo 2 catalog; in particular, the way in which we demonstrate that more distant galaxies appear smaller and dimmer in the classification interface, and how this can be corrected. I showed data for 4 of the questions (smooth vs. features? is it an edge-on disk? is there a bar? are there spiral arms?) as examples of successful corrections that we’ve already done. The remaining 7 are being finished this week, with results looking good so far. Finally, I had a section summarizing the science results from using Galaxy Zoo 2 data. So far, these have all been led by members of our own science team (which you can find here). Our goal in releasing the full catalog, though, is to make GZ2 a community resource – we want other groups to use the data and write even more interesting papers. We know we have a unique data source – the challenge is to reduce it properly, put it in a useful public format, and help publicize it by writing papers and attending conferences. I had a lot of good conversations with other astronomers at this meeting, many of whom are very keen to see the data come out. Several interesting presentations raised questions we can explore with GZ2. I was intrigued by Michael Rutkowski’s (Arizona State) talk on the surprising amount of star formation and diversity amongst early-type galaxies, as well as Benjamin Davis’ (Arkansas) talk on using computers to measure the angle of spiral arms and how it relates to their central black holes. Overall, it was a great meeting both for general astronomy and for Zoo-related projects. The science team and I are finishing the first draft of the data release paper this month, and we’ll be submitting it to a journal shortly after. I’ll keep writing as we make progress – as always, thanks for your classifications that make my work possible! Can you post a link to the poster please Kyle? Sure. It’s available as a PDF at http://db.tt/iXIIM0zB – please feel free to read and comment, but cite (and preferably notify me) if you want to redistribute anything. How did you debias the GZ2 classifications for galaxies for which there is no redshift? What do you do with galaxies for which the DR7 zConf is, um, less than ideal (<0.9, say)? Going from GREATER to CLEAN (presumably CLEAN is a proper subset of GREATER) shows rather strong variation; for example. for "nothing odd" it's ~68%, but for "dominant bulge" it's not even 3%! It would seem that zooites' perceptions can be quite subjective; what's a "dominant bulge" to me may be merely an "obvious bulge" to you (and we both consistently classify all relevant galaxies accordingly). – Galaxies with no spectroscopic redshifts aren’t being debiased right now – these constitute about 15% of GZ2. We don’t use zConf explicitly to weight the corrections because the vast majority of the galaxies have uncertainties of less than 0.5%. Like GZ1, we will publish the raw votes for galaxies without redshifts; I am considering using the photo-z’s for these galaxies and providing adjusted votes for those galaxies based off the correction from the spec-z sample. – The differences in GREATER to CLEAN samples have several causes: the true distribution of galaxies with these parameters, the perception of the Zooites’ classifications, and the choice of a threshold. The first might indicate simply that very few galaxies have a dominant bulge (we can compare these to other catalogs that count S0/Sa galaxies, for example). The second point is quite apt – that’s why we get dozens of classifications per galaxy so we can average over the individual variance. Finally, it’s a good example of picking your threshold carefully – while we used CLEAN = 80% for the GZ1 data, it looks like it’s likely not the best choice for all of the GZ2 tasks. Part of the catalog release is adjusting this for the different tasks, which results in a variety of the CLEAN thresholds. How do you detect a dominant bulge, and what does the term redshift actually mean, and in what regards? A dominant bulge is based on the classifications by volunteers: if they said a galaxy had a disk and was face on, then we asked them to assess how strong the bulge was (with four options: no bulge, just there, obvious, and dominant). We illustrated this with example pictograms on the selection buttons. The number of galaxies in this table are those for which the Zooites chose the “dominant” option more than any other. The term “redshift” is a way of expressing the distance to the galaxy; a higher value means that it’s further away from Earth. It’s important here because galaxies that are further away look fainter and smaller on your screen; much of the work I’m doing is trying to account for that in the Galaxy Zoo 2 classifications.